Allen Dewey Antonsen, age 81, passed away Wednesday, January 23, 2019, at Sanford Hospital in Fargo, North Dakota, surrounded by his family. Allen was born June 16, 1937, in Frazee, MN, to Dewey and Florence Antonsen, the third of 4 children. He grew up in the Methodist Faith and went to school at Rose Lake Country School and Frazee High School. After high school, he enlisted in the National Guard in Detroit Lakes from 1958-1964. On May 2, 1964, he married Marion Schepper and together they raised two sons: Scott and Jay. 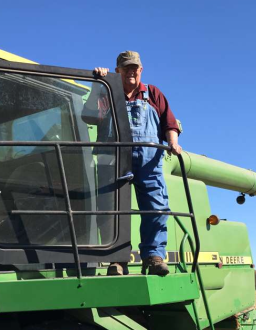 Allen lived on the home farm his entire life, farming and collecting John Deere tractors and toys. He and Marion spent many winters traveling the southwest States. He especially liked to go for rides traveling the back roads. Allen is survived by his wife, Marion; two sons: Scott and Jay (Kimberly); three grandchildren: Bayleigh (Payton) Lautenschlager, Anissa, and Jayden; sister: Olive Hanson; brothers-in-law: Roger Simon and Allan Peterson; along with many nieces and nephews. Preceding Allen in death were his parents, Dewey and Florence; sisters: Phyllis Simon and Jill Peterson; brothers-in-law: Rodney Hanson and Kenneth Schepper and his wife Marlys; niece: Jolyn Priem; and nephew: Ryan Peterson. A memorial graveside service with Military Honors at Vergas Village Cemetery will be held April 27, 2019 at 2:00pm. There's still time to send flowers to the Graveside Service at the Vergas Village Cemetery at 2:00 PM on April 27, 2019.